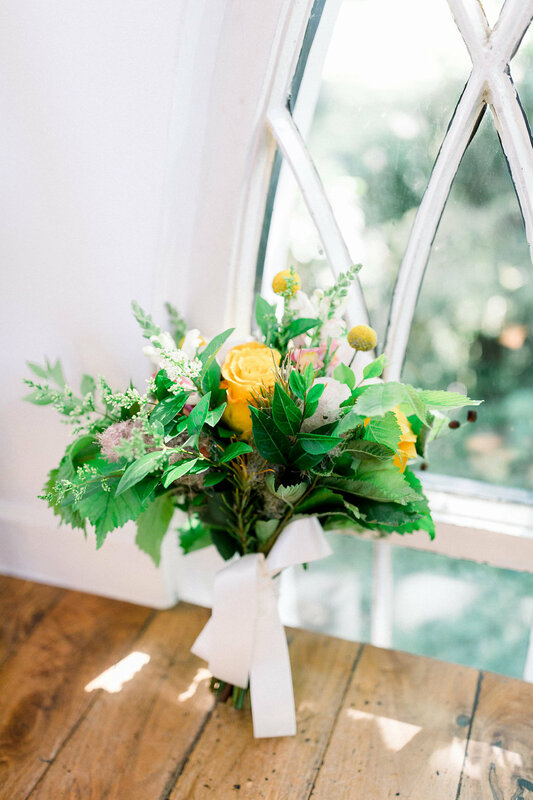 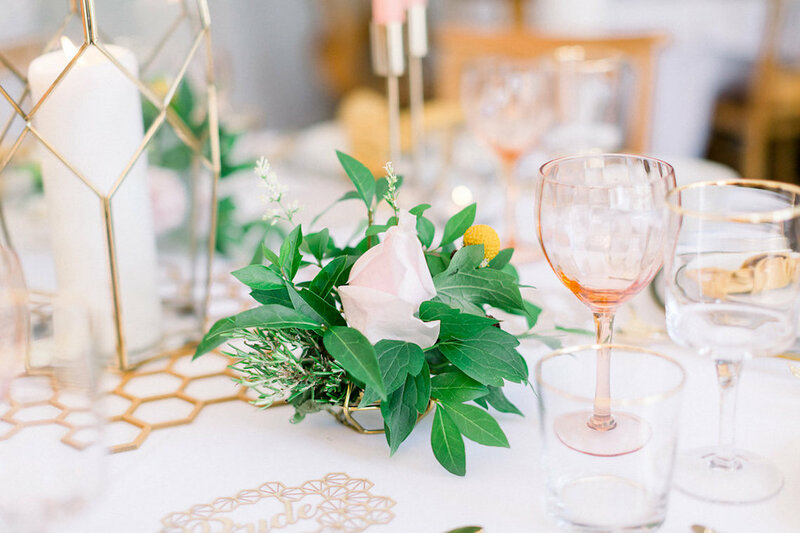 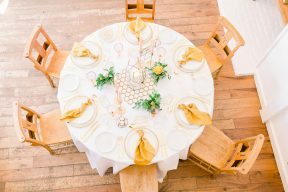 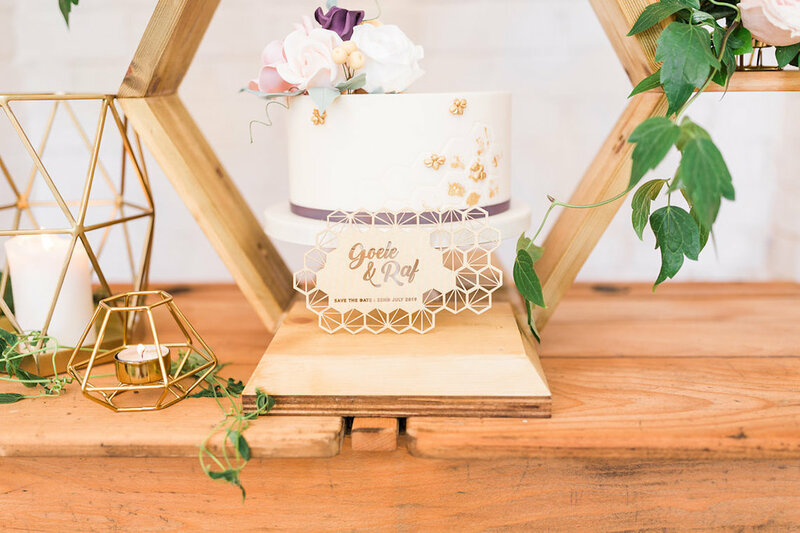 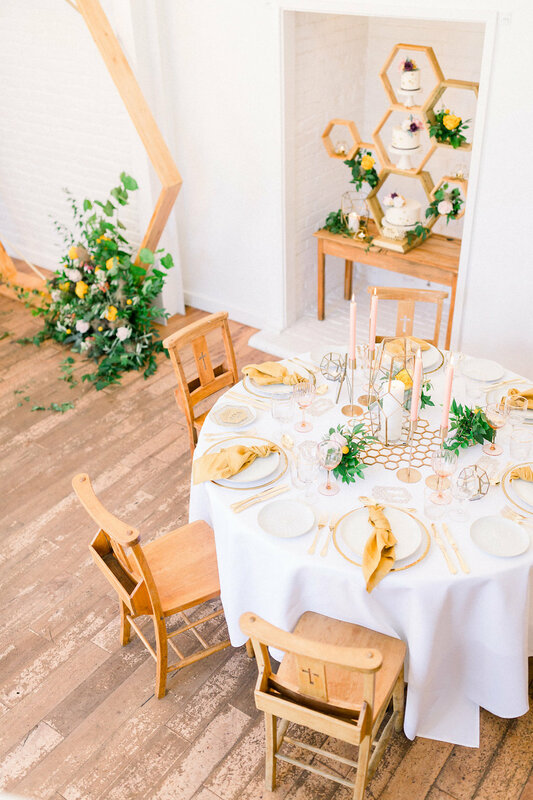 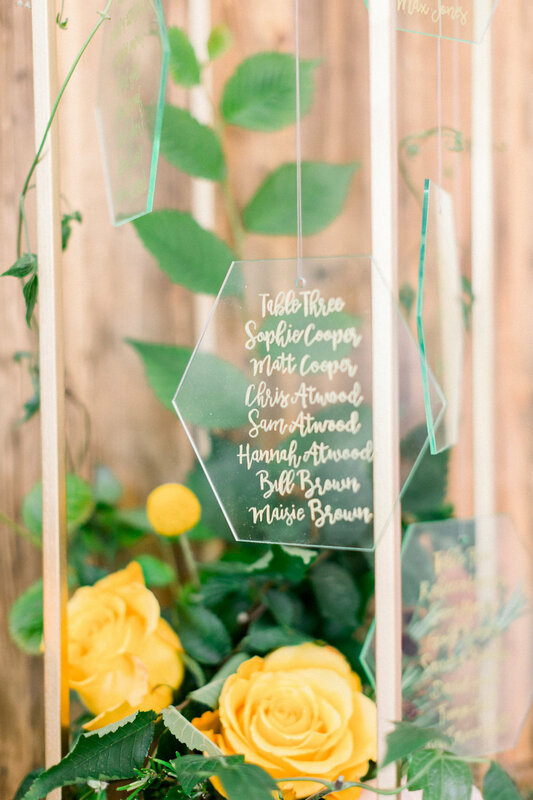 Camilla J Hards Photography and Party Squared sprinkle B.LOVED today with this bright and beautiful wedding inspired by sweet Honey Bees! “Showcasing a combination of creative and unique elements, modern styling and luxury artisan accessories. 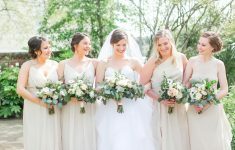 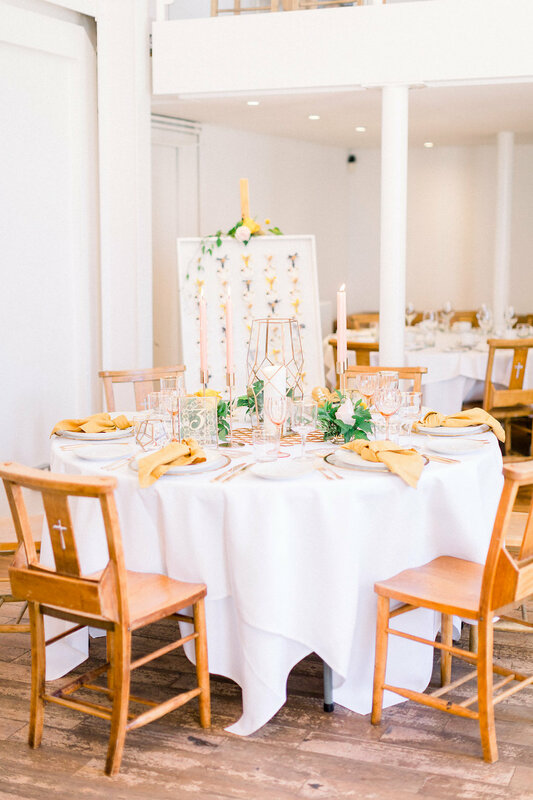 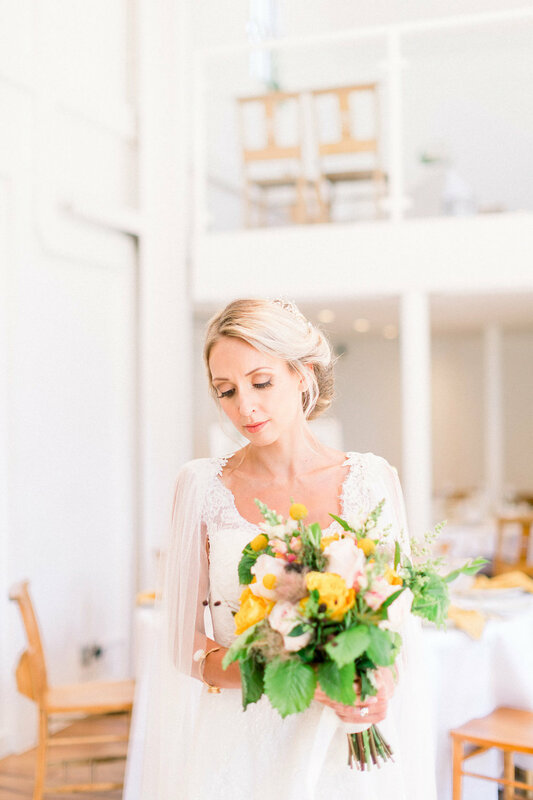 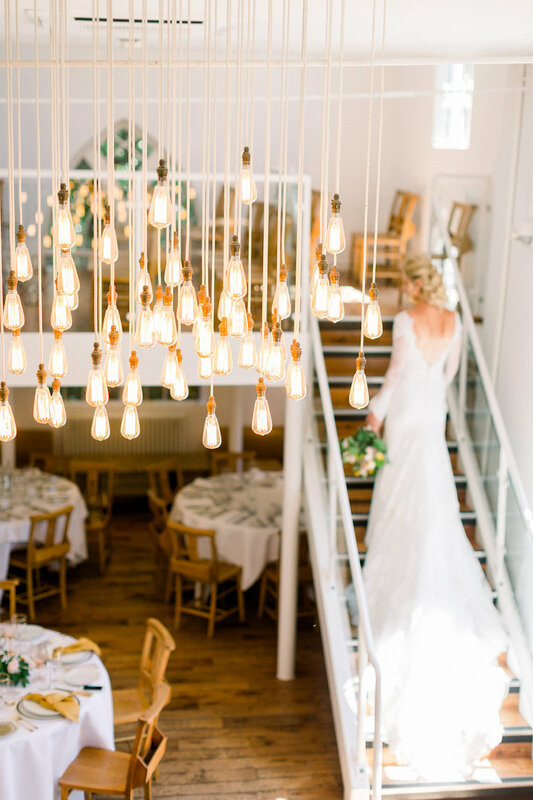 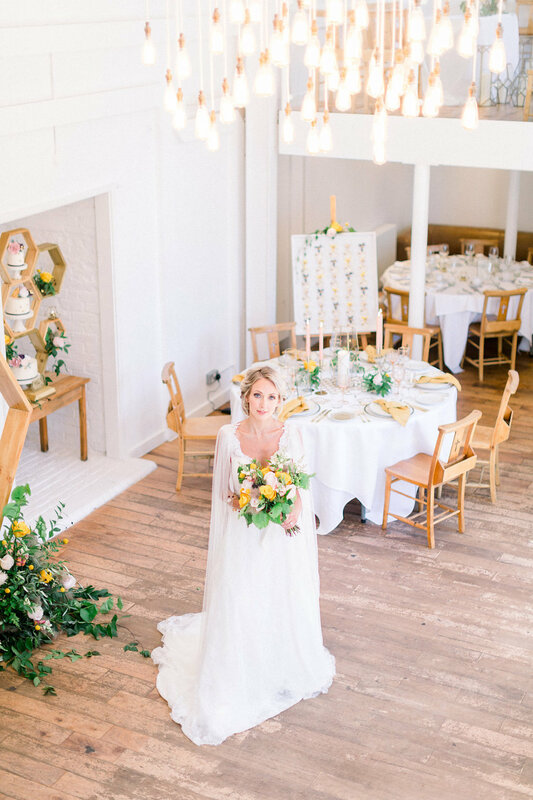 The idea was to compliment the beautiful geometric features in grade II listed school house venue, The Old Parish Rooms and to use crisp white backdrop and abundance of natural light to create a light and romantic wedding set up with a boho feel. 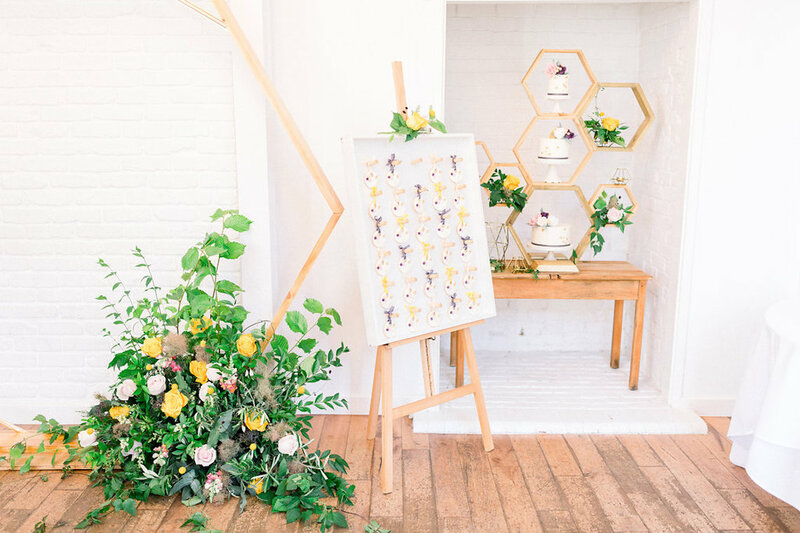 Visual inspiration for the shoot was taken from honey bees; honeycomb shapes and patterns, and pretty garden flowers. 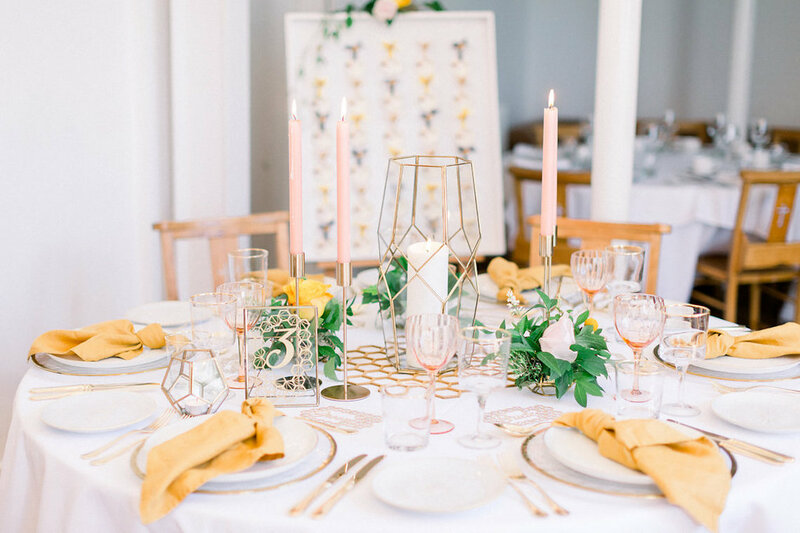 The colour palette was created by selecting a combination of warm honey hues, adding a modern bold mustard yellow and soft pale pink to both contrast and compliment. 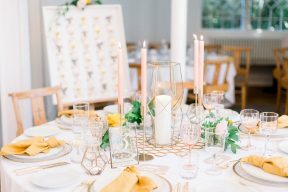 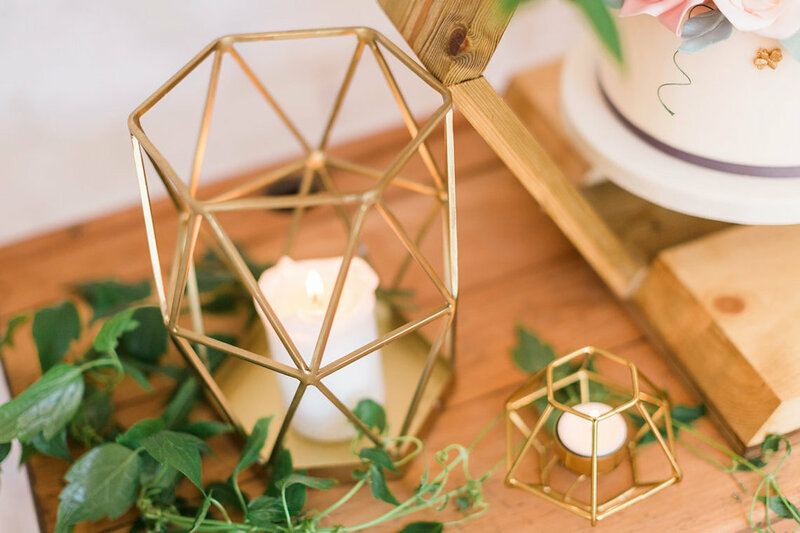 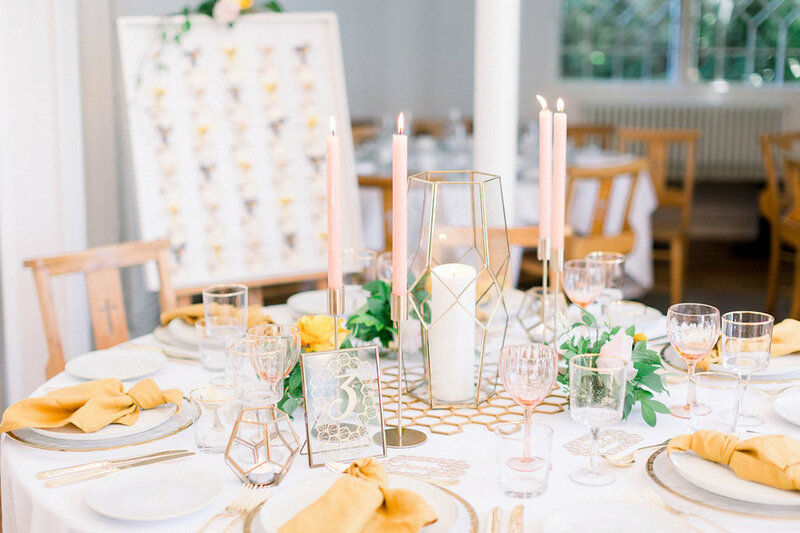 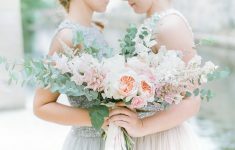 With imaginative design as the focus for this chic bohemian wedding, a number of artisan wedding creatives were sourced to collaborate on the shoot. 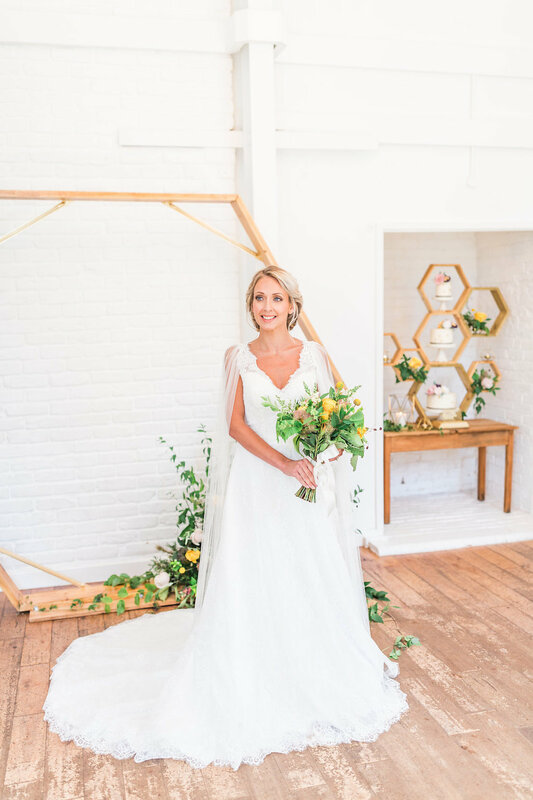 What Katy Did Next supplied handmade honeybee hair accessories and a pair of hexagonal earrings created especially for the shoot. 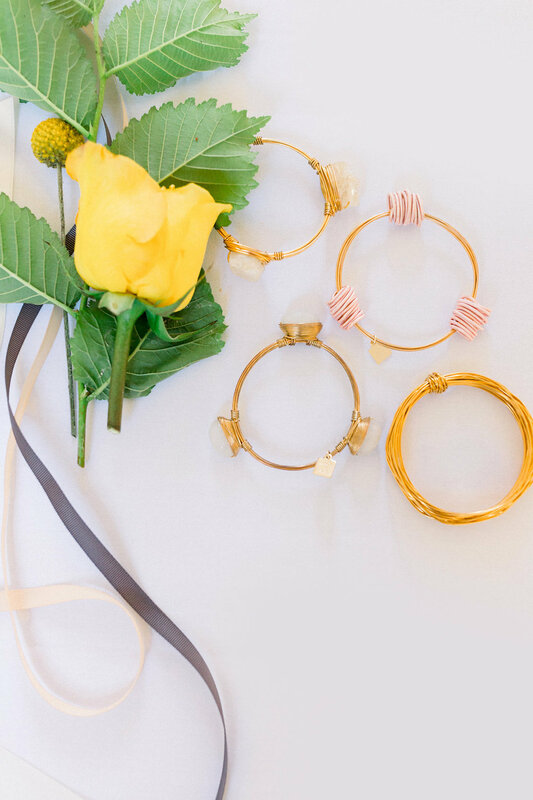 Black and Sigi supplied a series of handmade wire and stone bangles for our boho bride. 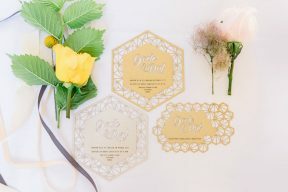 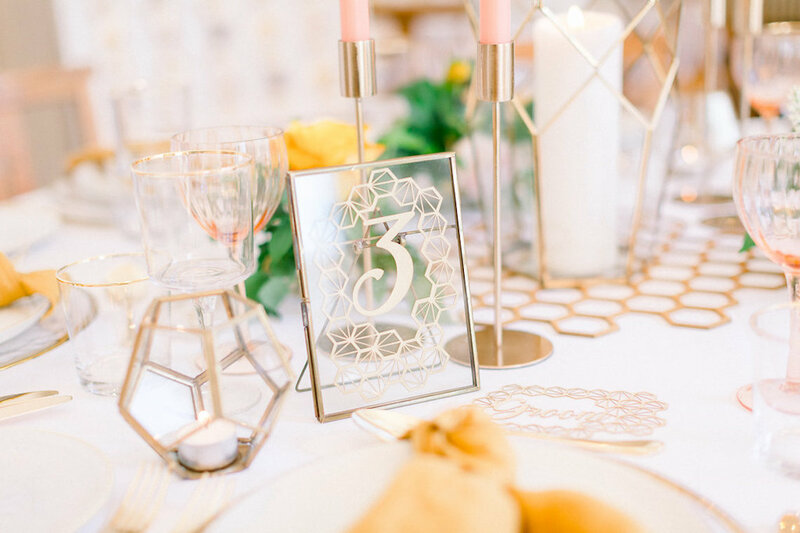 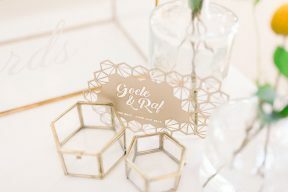 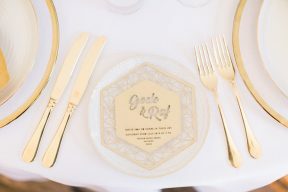 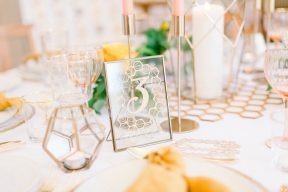 Pen and Fold created intricate laser cut wedding stationery; including honeycomb table numbers and place names, hexagonal invitations and save the date cards. 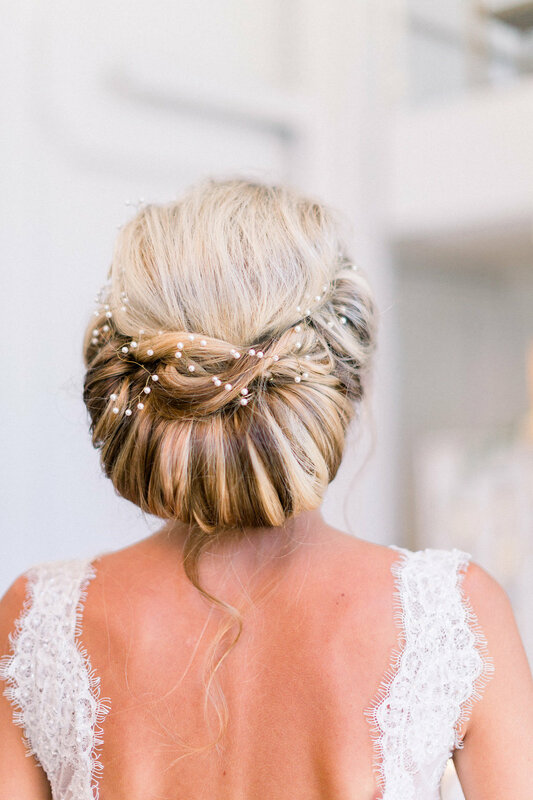 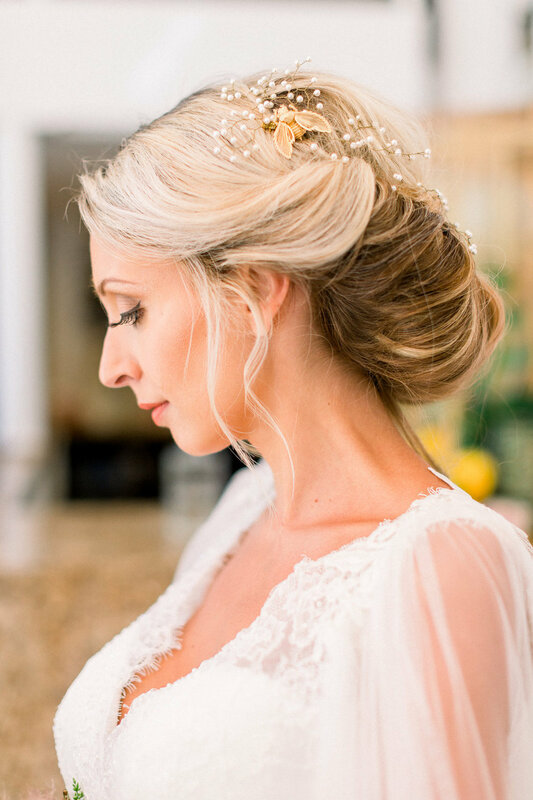 The bridal styling, hair and makeup were classic and elegant with a hint of bohemia. 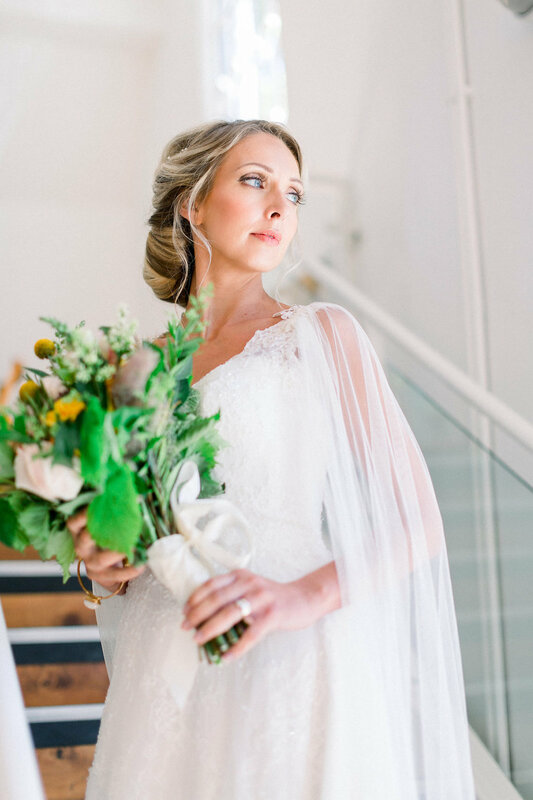 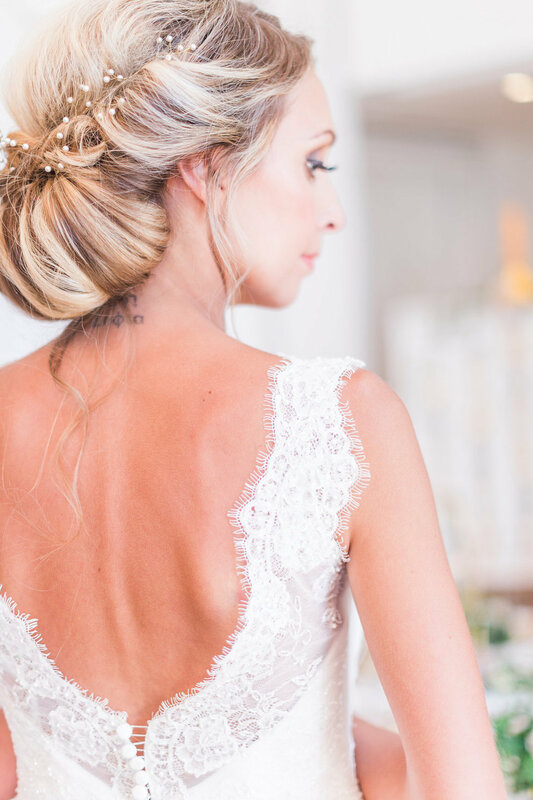 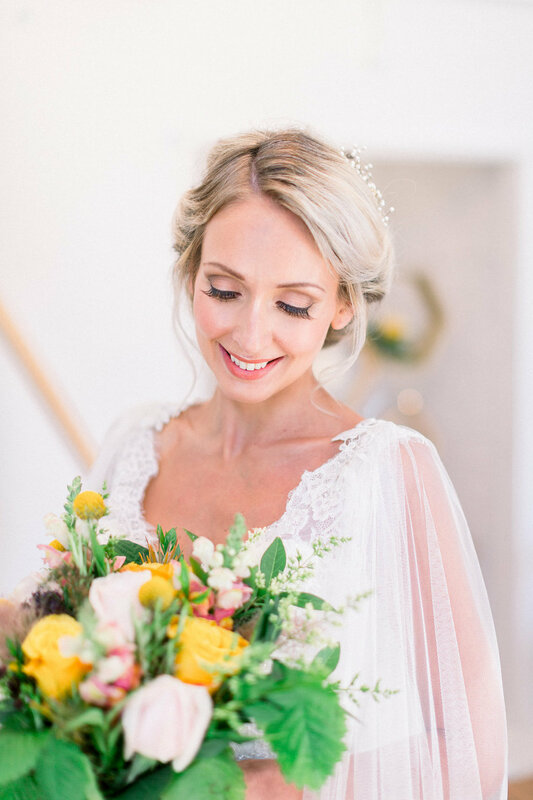 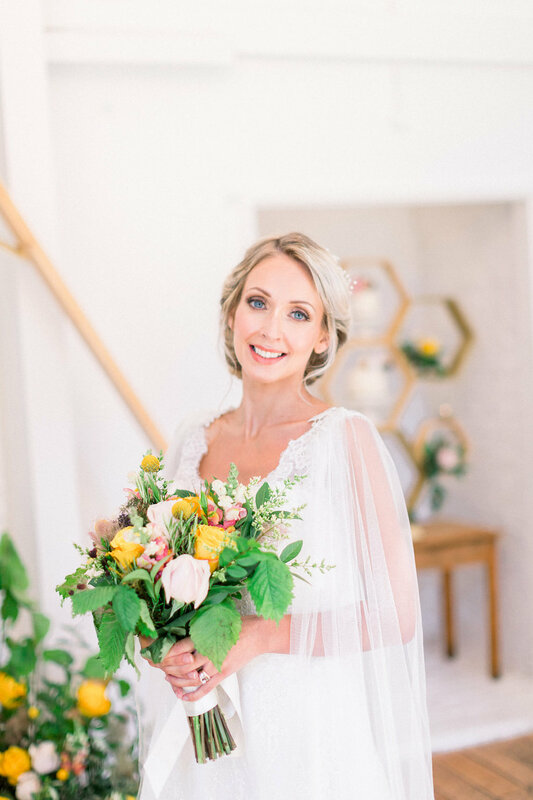 The bride wore the Nicole dress from Nicole Spose from the Turner and Pennell Bridal Gallery and a handmade cloak style veil with lace detail from Sash and Veil. 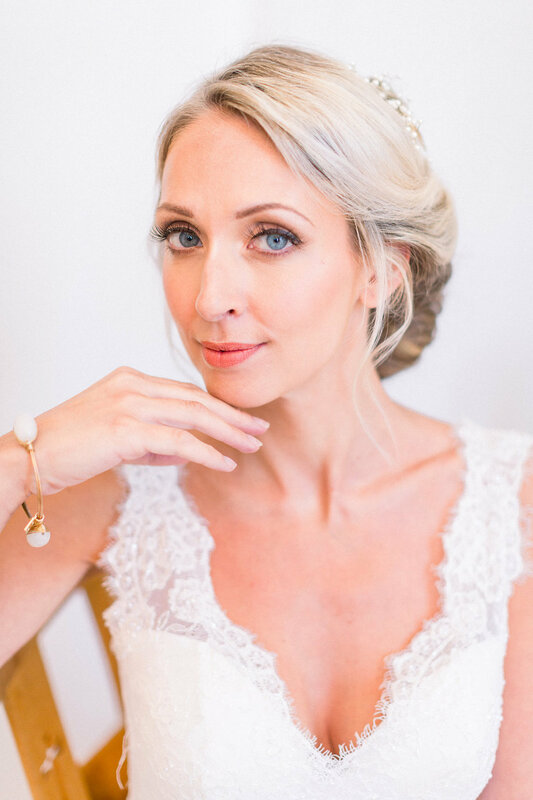 The makeup look created by Alexandra Sullivan was natural and pretty using the pink tones from the colour palette. 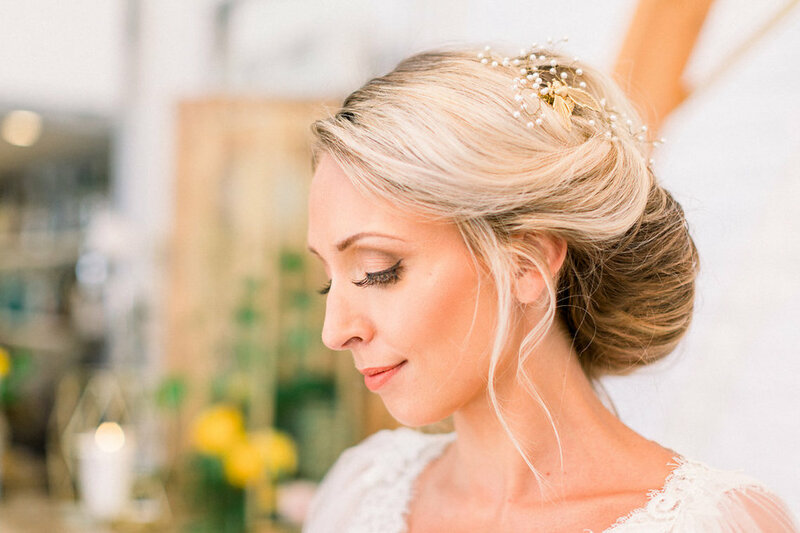 It focused on featuring the bride’s brilliant blue eyes.The hair style a classic and sophisticated sweeping up do was created by Gemini Styling to include the beautiful hair accessories chosen for the shoot. 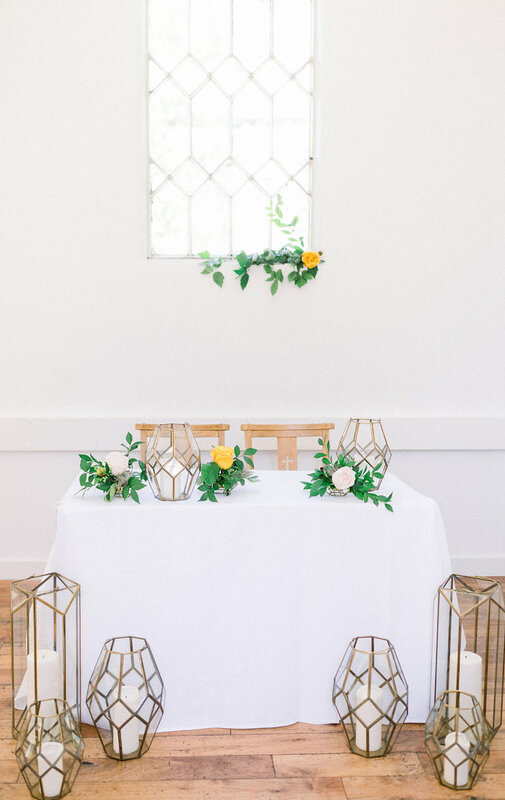 Collaboration and creativity was at the heart of the styling. 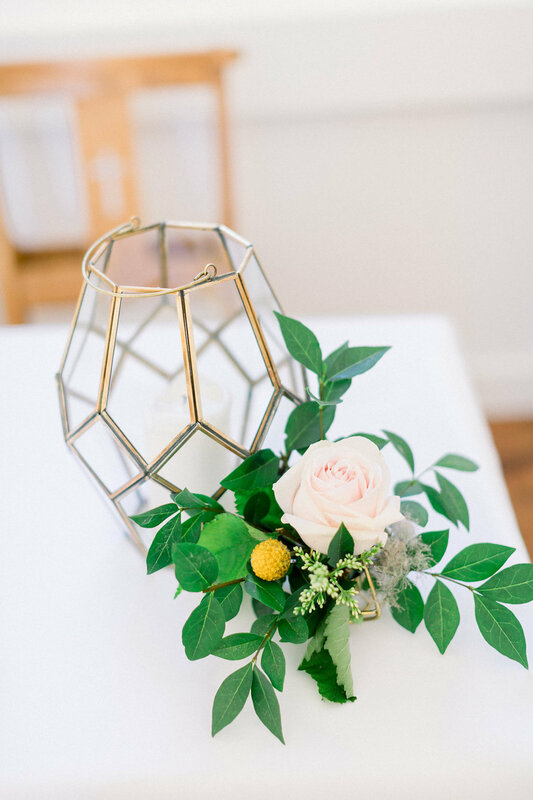 Suppliers worked in tandem aligning their skills and vision to craft contemporary and interesting geometric features. Party Squared and Pinkface Cakes worked together to create a unique and bespoke cake display. Taking inspiration from the royal wedding, and the royal couples’ decision to break with tradition, a bespoke cake display was designed that allowed the cakes to stack without being stacked. 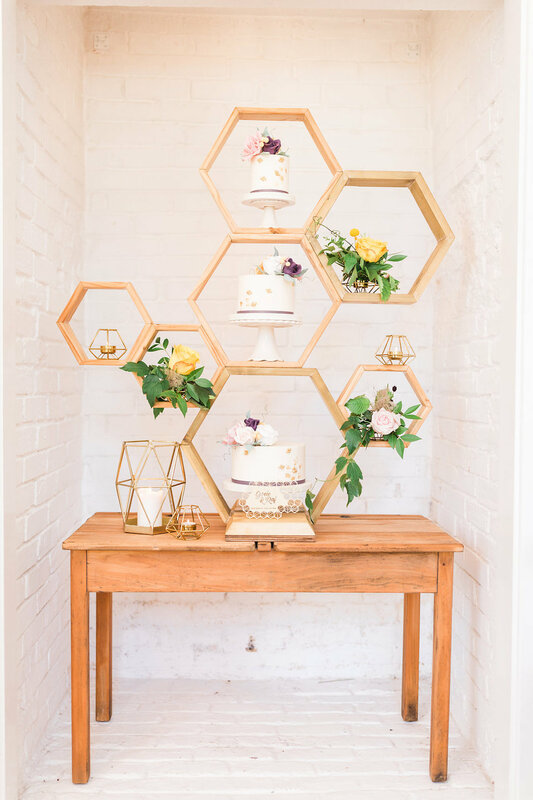 Each cake tier was placed on its own mini cake stand and displayed within the honeycomb structure. 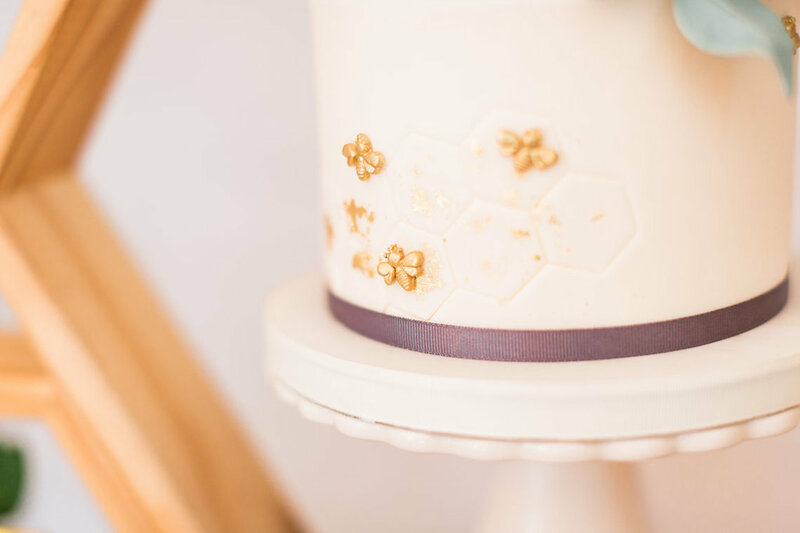 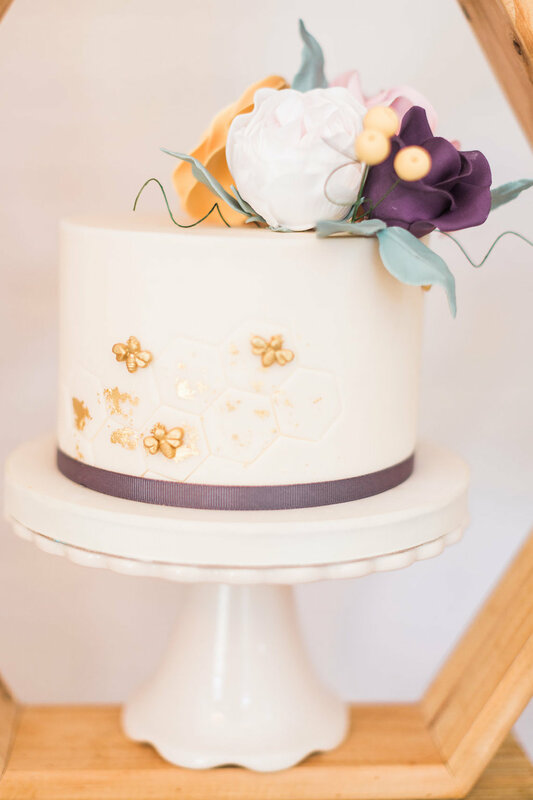 The ivory wedding cakes were decorated with a honeycomb design, tiny gold honey bees and delicate roses. 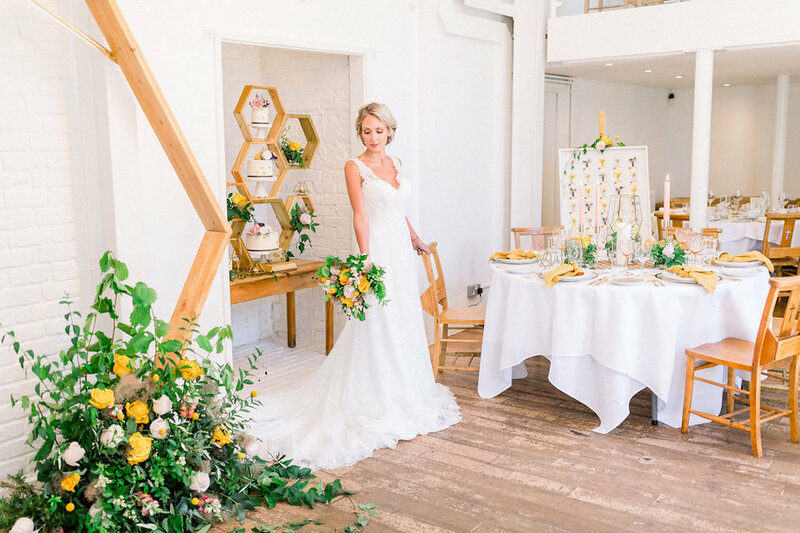 The flowers by The Botanical Shed were bold in colour and styling, yet soft and textured. 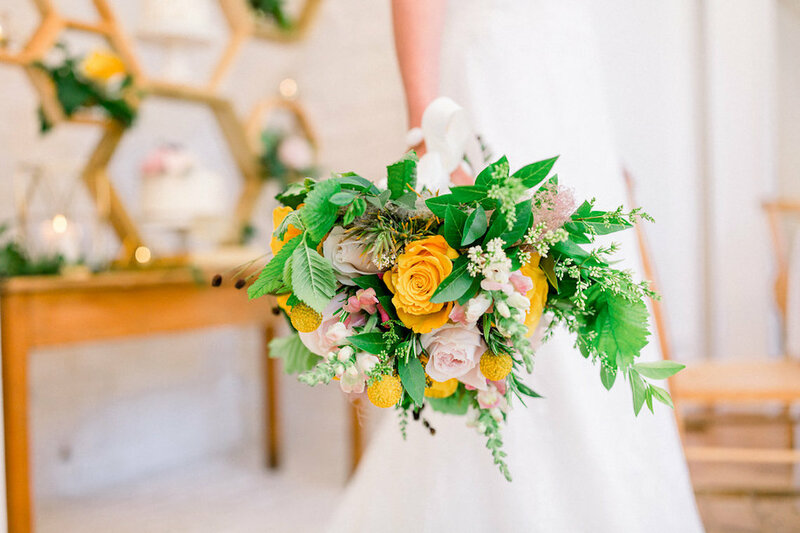 Mustard, pale pink and yellow were married with lush green garden greenery including hornbeam and rosemary. 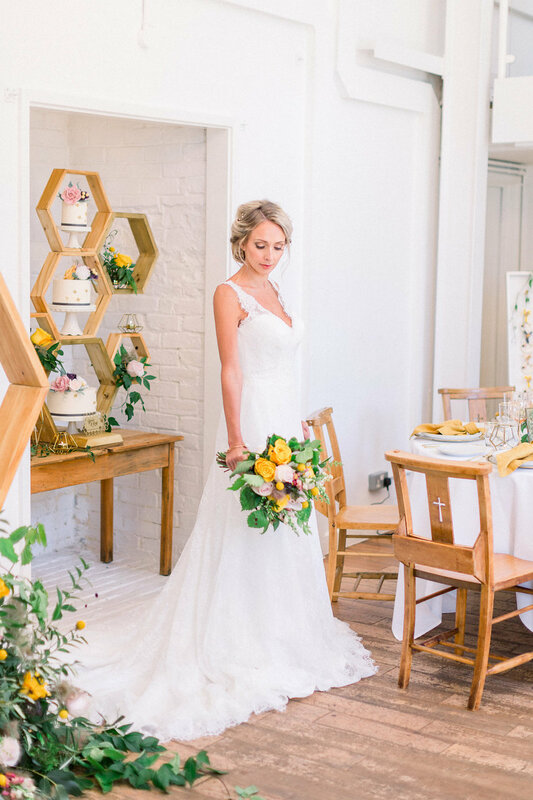 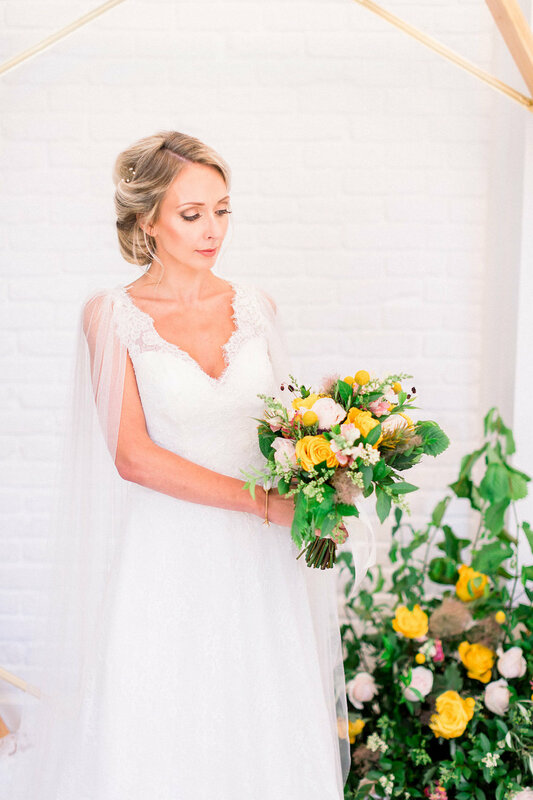 The natural country garden feel of the backdrop flowers and bouquet were inspired by bee friendly flowers, wild meadows and gardens. 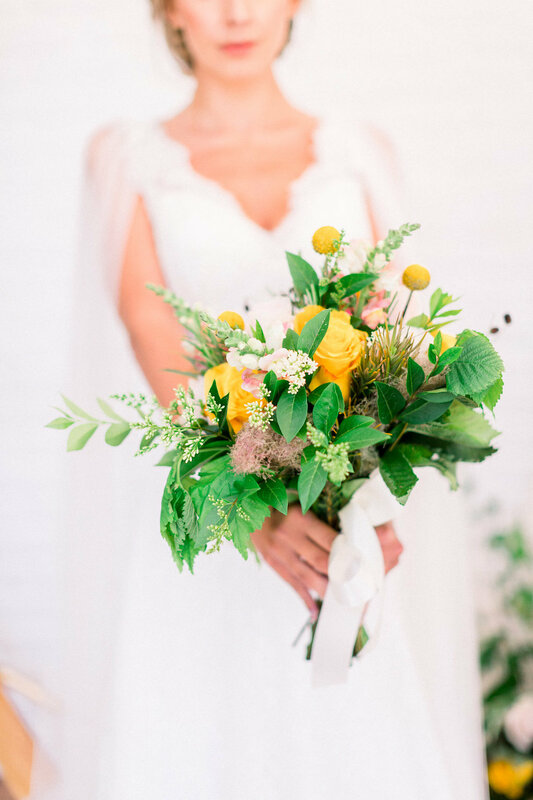 Beautiful Penny Lane and Earl Grey roses were combined with quirky craspedia and cottony smoke bush, rosemary and hornbeam. 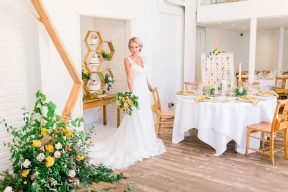 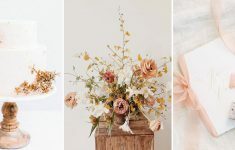 These unique choices brought interest and plenty of texture to the shoot and added warmth and contrast to the colour palette.